Produce and deliver quality cement and clinker as per customers requirement with an aim to enhance customer satisfaction. Continual improvement in Quality, Health, Safety and Environmental Performance. A growing trend in business is the emphasis on sustainability Environmental Conservation Practices We at Mangalam Cement are committed to Environmental Conservation. At Mangalam Cement, the strategy for steady growth is a focused approach to the future. Mangalam Cement Limited was promoted in the year 1978 by the famed House of Syt B.K. Birla, the most eminent and illustrious industrialist of the country. It is a professionally managed and well established cement manufacturing company enjoying the confidence of consumers because of its superior quality product and excellent customer service. The meeting of the Board of the Directors of the Company will be held on Thursday, the 07th February, 2019 at Kolkata, inter alia, to consider and approve the Unaudited Financial Results of the Company for the quarter and nine months ended 31st December, 2018. The meeting of the Board of the Directors of the Company will be held on Tuesday, the 13th November, 2018 at New Delhi, inter alia, to consider, approve and take on record the Unaudited Financial Results of the Company for the quarter and half year ended 30th September, 2018. The meeting of the Board of the Directors of the Company will be held on Friday, the 03rd August 2018 at New Delhi, inter alia, to consider, approve and take on record the Unaudited Financial Results of the Company for the quarter ended 30th June, 2018. The Meeting of the Board of Directors of the Company will be held on Tuesday, 15th May, 2018 at New Delhi inter-alia to consider and approve the Audited Financial Results of the Company for the Quarter / Year ended 31st March, 2018 and to recommend Dividend, if any on the Equity Shares for the year ended 31st March, 2018. The Meeting of the Board of Directors of the Company will be held on Tuesday, the 08th August, 2017 at New Delhi interalia to consider and approve the Unaudited Financial Results of the Company for the Quarter ended June 30, 2017. The Meeting of the Board of Directors will be held on Saturday, 13th May, 2017 at New Delhi interalia to consider and approve the Audited Financial Results of the Company for the Quarter / Year ended March 31, 2017 and to recommend Dividend, if any on the Equity Shares for the year ended 31st March, 2017. The Meeting of the Board of Directors will be held on Saturday, 11th February, 2017 at New Delhi interalia to consider, approve and take on record the Unaudited Financial Results of the Company for Quarter / Nine Months ended December 31, 2016. The meeting of the Board of Directors of the Company will be held on Saturday, the 05th November, 2016 at New Delhi, interalia, to consider, approve and take on record the Unaudited Financial Results of the Company for the quarter and half year ended 30th September, 2016. 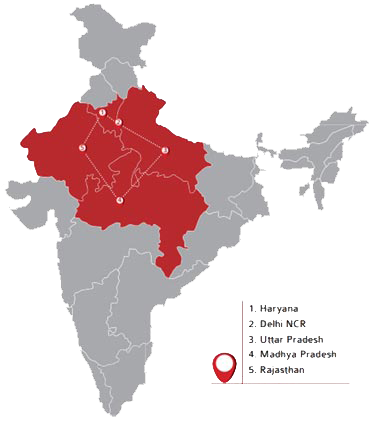 The Company has commenced Commercial Production of the New Cement Grinding Unit with a capacity of 0.75 Million Ton Per Annum (MTPA) at Aligarh, Uttar Pradesh. The overall capacity is now enhanced from 3.25 MTPA to 4.00 MTPA. The Company has commissioned trial run of the New Cement Grinding Unit of 0.75 Million Ton Per Annum (MTPA) at Aligarh on 10th August, 2016. The overall capacity is now enhanced from 3.25 MTPA to 4.00 MTPA. The Meeting of the Board of Directors will be held on Saturday, 06th August, 2016 at New Delhi interalia to consider, approve and take on record the Unaudited Financial Results of the Company for Quarter ended June 30, 2016. The Meeting of the Board of Directors will be held on Wednesday, 03rd February, 2016 at New Delhi interalia to consider the Unaudited Financial Results of the Company for Quarter / Nine Months ended December 31, 2015. 39th Annual General Meeting of the Company will be held 17th August, 2015. 39th Annual Report 2014-15 and Notice.